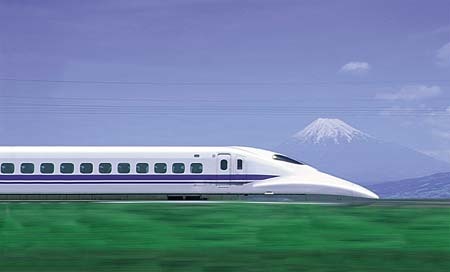 The opening of the Tokaido Super Bullet Train in 1964 marked the end of rehabilitation days after the World War II at the same time the beginning of mass transportation age by means of high speed trains in Japan. Thereafter, the more fast comfortable new transportation system was sought for in air, land, and sea. Yet, there were much difficulties for trains, since specific issues such as motion direction and tunnel use were still under development for long time. For instance, because trains cannot switch its body direction at terminals, ideal form for advance may not be so for the retreat. This "700 Series" Shinkansen is a true solution in every ways. The aluminum double skin body, large pleasant interior applying new air condition system, additional air ventilation device for smoking, energy free and regeneration brake realized by light and less air resistance body, new maintenance system applying boltless body side inspection, are all unique features of super bullet train of the next generation focusing on speed, comfort and convenience for both the passenger and the operator, and confront with global environmental issue.